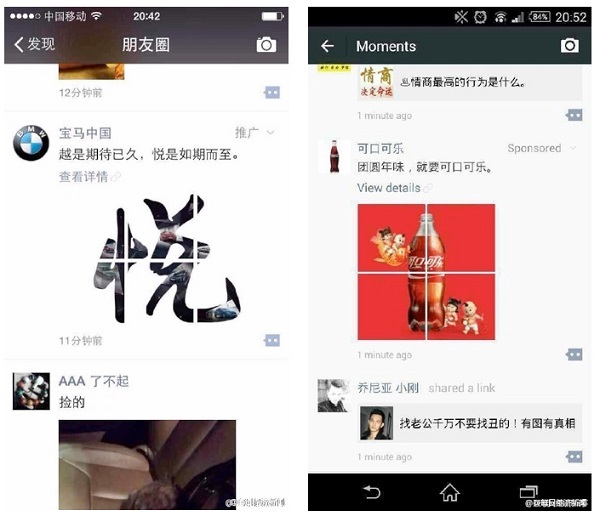 A large number of WeChat users have received the first ads in the app’s Moments section, where users share information with friends, similar to Facebook’s timeline. The ads came from an account named “WeChat team,” which is automatically added to users’ friend list and operated by Tencent Holdings as displayed on the account label. The first ad was a test message by Tencent itself, saying “ads can be a part of life”, without any marketing material specific to a brand. Regular ads in the service then began appearing in users’ timelines over the weekend, and among the first ones to pop up were advertisements for global brands BMW and Coca-Cola (pictured above). Chinese smartphone maker Vivo also has ads on the service. The company did not disclose how it will help its clients spread their ads among WeChat users. However, according to the blog China Internet Watch, the starting ad budget is RMB5 million with CPM of RMB40. Targeting options include geographic location, education level, and age. CPM goes up to RMB140 if a key city like Beijing is targeted; sharing option will charge extra 20%. People can “like” and comment on the test ads, and also hide them. Previously, brands could interact with users through official accounts, though they are quite limited in how often they can reach out to their fans.